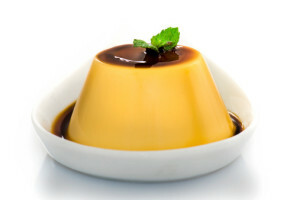 The Roman Empire reached its fate in 476 A.D., but not before the Spanish adopted flan and began glazing it with a sweet caramel sauce. The Spanish then brought flan to their newly found lands in Mexico where the classic flan with caramel sauce evolved into the many flavors that we have today, such as chocolate, coffee, cinnamon, orange, and almost any flavor that you have a taste for. This flan recipe by Martha Stewart focuses on the taste of authentic caramel flan. Prepare oven and ramekins: Heat oven to 325 degrees. Place a small bowl of cold water and a pastry brush near the stovetop, and prepare an ice-water bath. Place eight 4-ounce ramekins in a large roasting pan. Bring a large kettle or pot of water to a boil. Make caramel: In a saucepan over medium-high heat, mix sugar and water, stirring to combine. Do not stir again. Cook, washing down sides of pan with a pastry brush dipped in water to prevent crystals from forming, until caramel is amber, about 8 minutes, swirling pan to color evenly. Remove from heat, and immerse bottom of pan in ice-water bath for 3 seconds to stop cooking. Dry bottom of pan. Working quickly, pour about 1 tablespoon caramel into each ramekin, swirling each to coat bottoms evenly. Make custard: In a small saucepan, heat milk with half the sugar (1/4 cup plus 2 tablespoons) over medium heat just until mixture starts to steam and bubble around the edges, 5 to 6 minutes (do not let it boil). Meanwhile, whisk egg yolks: In a large mixing bowl, whisk together the eggs, yolks, remaining sugar, and salt. Temper eggs: Add ladle of hot milk mixture to the egg mixture and whisk to combine. (This is called tempering, and it prevents the eggs from curdling.) Add two more ladles of milk mixture, one at a time, whisking to combine after each addition. Gradually whisk in remaining milk mixture. Strain: Strain through a fine sieve into a large liquid measuring cup or a bowl (to remove any cooked bits of egg). Stir in vanilla. Bake: Divide custard evenly among ramekins. Place pan in oven. Add enough boiling water to pan to come halfway up the sides of ramekins. Bake until custards are just set (they should tremble slightly in center when shaken), 35 to 42 minutes. Chill and serve: Remove pan from oven. Use tongs to carefully remove ramekins from hot-water bath and place on a wire rack for 30 minutes. Then, cover with plastic wrap and chill for at least 8 hours (or up to 3 days). To unmold, run a sharp knife around inside of ramekins, and place a rimmed serving plate upside down over top of each. Invert, and gently lift ramekin to remove. Serve immediately. To make a large flan, prepare caramel as directed above and pour into an 8-inch round cake pan. Top with custard, then set pan in a hot-water bath and bake, chill, and serve as directed. For more authentic Mexican food recipes, browse the Acapulco’s Mexican Family Restaurant & Cantina blog and practice your cooking skills. When you want to take a break from the kitchen, stop by one of our restaurants located all across Massachusetts and Connecticut to enjoy an authentic Mexican meal.